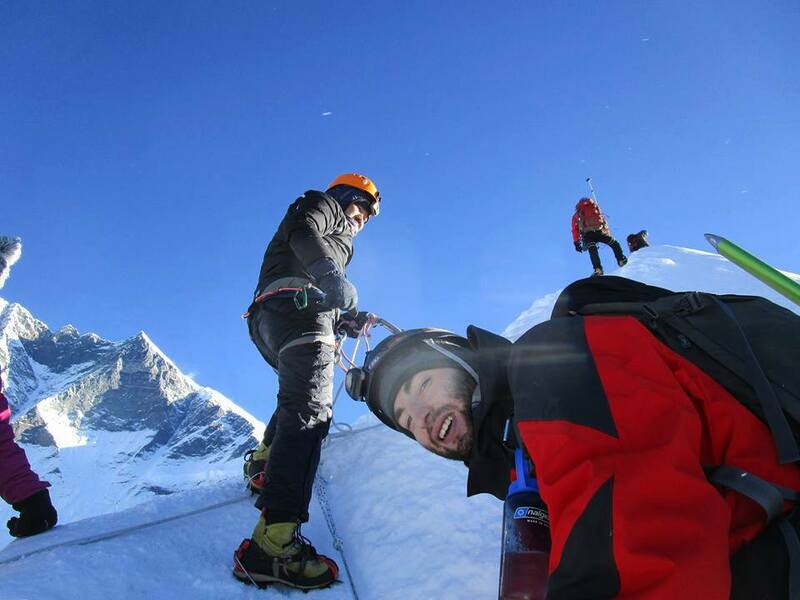 Mera Peak is the highest permitted trekking peak of Nepal. It stands to the south of Everest and dominates the watershed between the heavily wooded valleys of the Hinku and Hongu Drangkas. J.O.M. Roberts and Sen Tenzing made the first successful ascent on 20 May 1953. The trek starts from Kathmandu with a drive to Jiri and a trek to Lukla at 2800m. This is a good way to begin as it helps develop physical fitness and is excellent for altitude acclimatization. But most of the people take a flight to Lukla and stay there overnight. 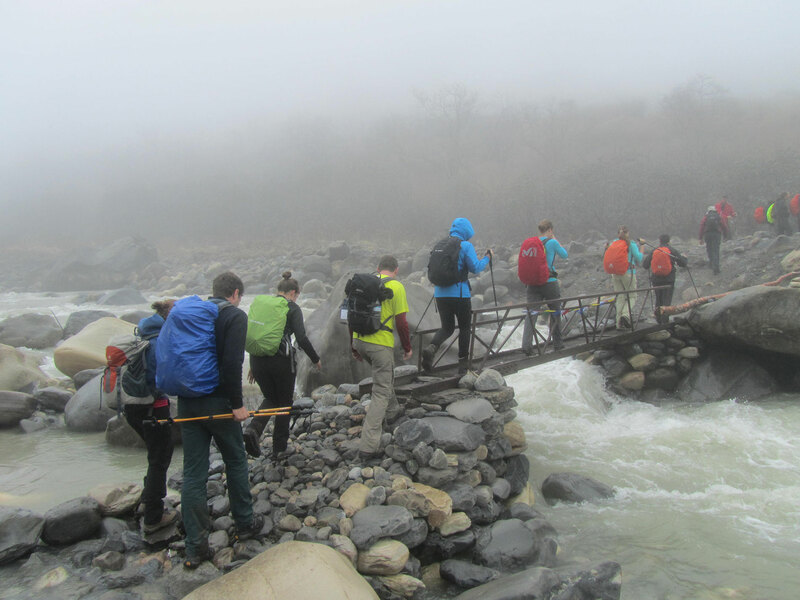 From Lukla to Chutanga we walk through rhododendron and pine forests. 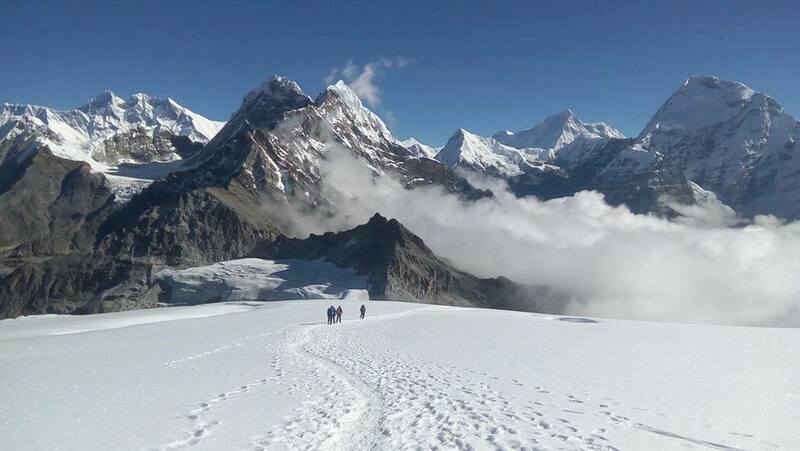 Crossing the Zatra-La pass the trek is very steep but the reward is a view of Cho Oyu, the world’s 6th highest mountain and the Numbur Himal. We now descend into the Mera Valley. 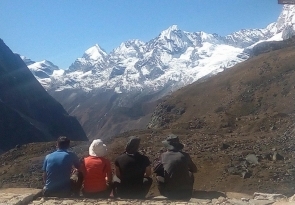 From Chatrabu, after a walk of about around one and half hours, we get the best view of Mera’s South, Central and North peaks. Then we go through more forests, of rhododendron, bamboo, and pine to reach Kothe (Hinku Khola) from where the trekking is easier to Khare Base Camp, at 5000m. 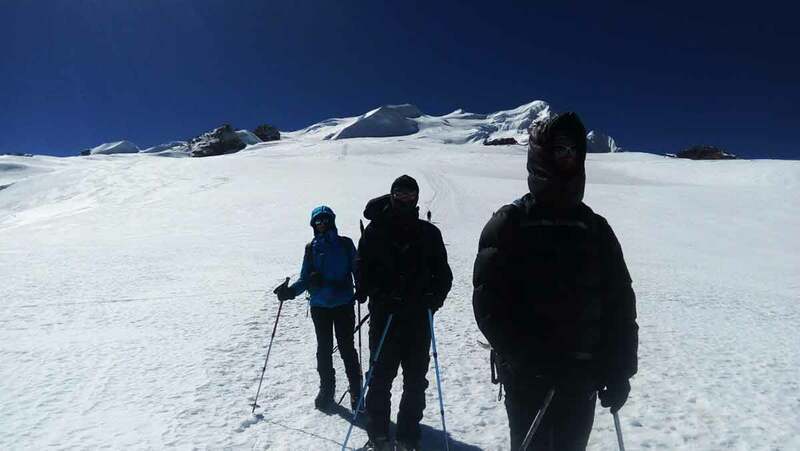 From Khare to Mera-La it is steep, but from Mera–La to our high camp at 5800m is easier, though we must take care as there are many deep crevasses. 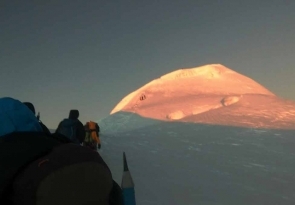 We will follow the ‘standard’ route to the summit, reaching the Central peak and, perhaps, the slightly higher North summit. 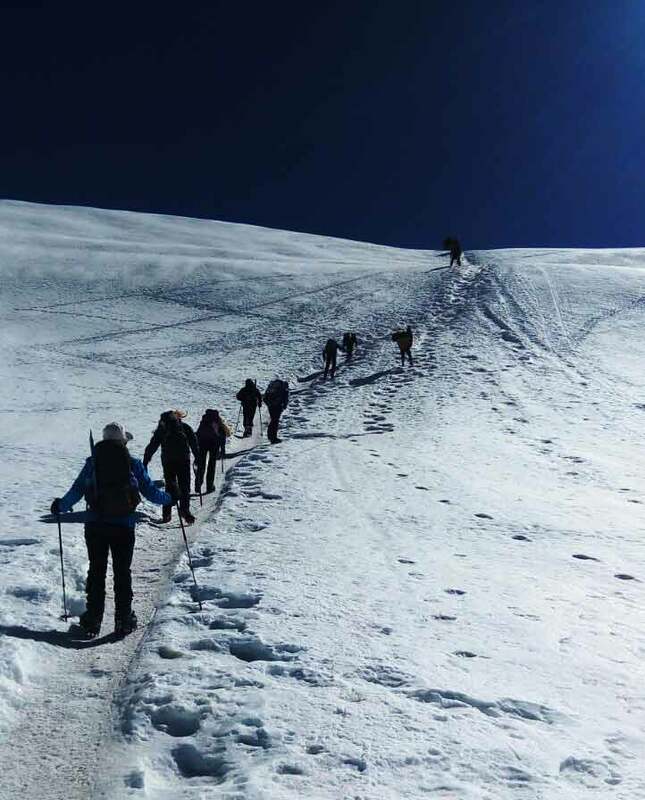 There are many other routes to the peak, but none of them are easy, some requiring the crossing of high and difficult passes (though, of course, this adds to the true mountaineering experience). 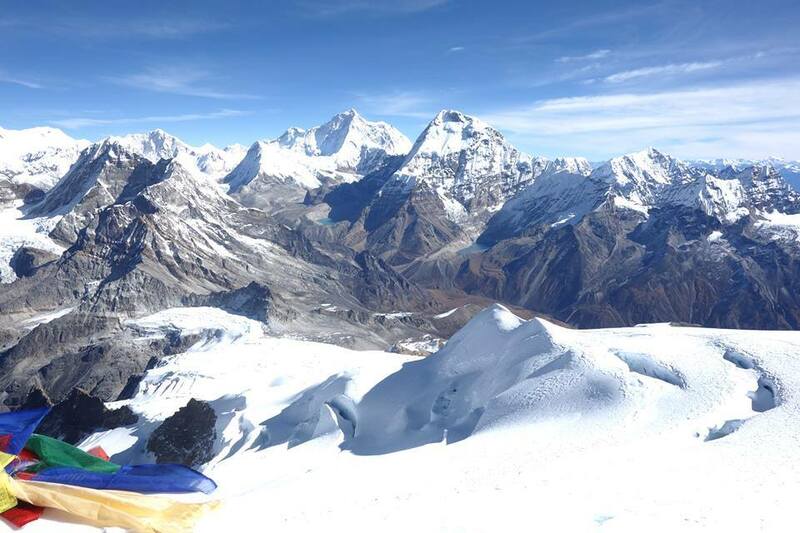 But in the end, all the effort and hard work pay off as Mera provides one of the finest viewpoints in Nepal, with a panoramic view of Chamlang, Kangchenjunga, Makalu and Baruntse to the east, and Cho Oyu, Ama Dablam and Kangtega to the west. Everest is seen to the north over the massive unclimbed south face of Lhotse and the Nuptse/Lhotse ridge. 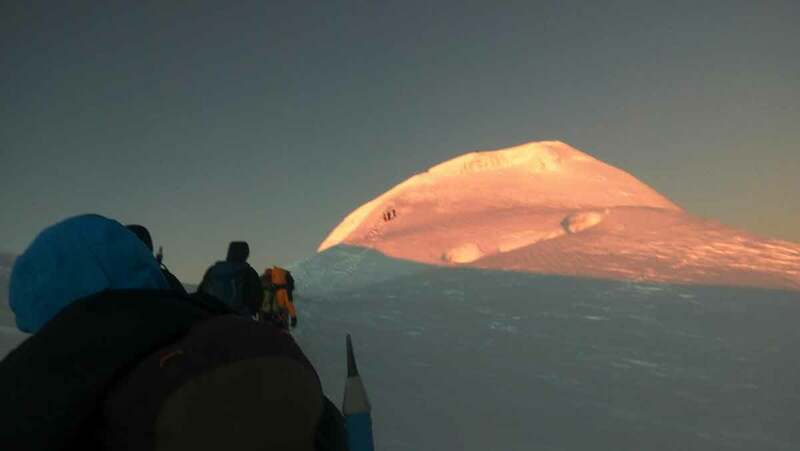 Under favorable conditions, it is possible to climb the peak and to descend to Base Camp on the same day. Early morning after breakfast, we get transferred to domestic airport to fly to Lukla. After an adventurous 40-minute flight above breathtaking green and white mountains, we reach Tenzing-Hillary Airport at Lukla. This is one of the most beautiful air routes in the world culminating in a dramatic landing on a hillside surrounded by high mountains peaks. At the airport, we meet our other crew members. We get time to stroll around while the guide divides and manages baggage to be carried by porters. We start our trek down from Lukla. 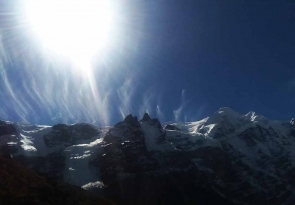 It will make sense to fly up to Lukla for acclimatization and walk down. We walk through the jungle down to Surke then a bit ahead we have lunch at Pakhapani or ahead nearby. Continuing ahead through many traditional villages, jungles, and hills, we gradually reach the vicinity of Paiya for the first night’s camp. We see number of peaks from here such as Knogde Ri, Khatang, Tang Ragi Tu and other peaks above 7 thousand meters from Paiya. The trail descends the rock-strewn path leading to the rhododendron forest. We come across a lot of Mani walls through the trail. Passing again through hills, ridges and teahouses, we start downwards and have lunch around there in village nearby. Mesmerizing views of the south face of Mera Peak (6064m/19890ft) and Naulekh Peak awaiting our insight ahead. The trail zigzags through forested areas and then descends steeply. We experience the most interesting and charming feelings as we walk past forests of pine and rhododendron to reach Nigmsa (Shibuche) where we camp for the night’s rest. After breakfast, we start up though a steep and slope trail through narrow and typical mountain trail, a bit complicated ahead through rhododendron and bamboo forests, we pass in the course of landslides and down we reach to the stream. By the side of the crystal clear stream we have our lunch today. Straight ahead and up through the rhododendron forests we may encounter wild animals if we are lucky. A little down through the bamboo jungle and past a nice stone cave by the side of a river, we will camp for the night’s rest. Today is another short-trek day in which we trek along the ridge of the Hinku Khola in the shadow of Mera Peak. We take lunch at Gondishung, the summer herders’ settlement in the west bank of the Hinku Drangka. Beyond Gondishung we pass a 200 year-old Lungsumgba Gompa where we can find Mera peak scripted in rock along with its route to reach Mera. We pray for our successful ascent of Mera Peak in the boulder of the Gompa offering incense. A short walk takes us to Thagnag, which is a summer grazing area with the primitive lodges and shops. Today is our rest day. It is not recommend to stay idle although it is a rest day instead we have to stay active to be ready for next day’s adventure. So after breakfast, we hike for about 3 hours up to Charpate Himal Glacier. Seen very close from the Thangnag, Charpate Himal is regarded holy by the Sherpa community and is worshiped by traditional Sherpas of the mountains. We will observe Mera North very close and outstanding from here. After an hour’s pleasant hike downwards, we will be back at the camp at Thangnang. We head towards Mera Base Camp at Khare. 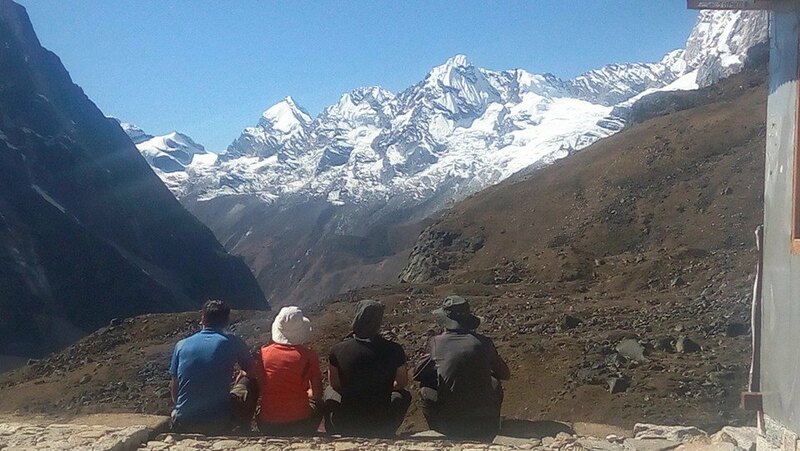 We follow the lateral moraine of Dig Glacier to Dig Kharka, which offers spectacular views of Charpate Himal. The trail climbs through moraines and to the snout of the Hinku Nup and Shar Glaciers and then climbs more steeply to our camping spot at Khare. The camping experience at Khare is something that would cherish us throughout our life. It is pleasure to view beautiful North face of Mera Peak from our campsite at Khare. Today after breakfast, we walk through boulder strewn course to reach Base Camp of Mera Peak. 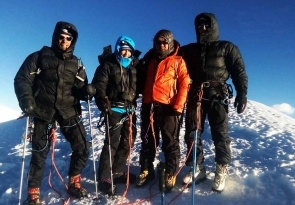 We have to march through steep route (about 260 meters) and it takes around 2 to 3 hours to reach Base Camp. Upon reaching there after a short rest accompanied with our lunch, we start ice climbing training with our climbing guide. Inexperienced climbers need to learn much more today. After about 2-3 hours training, we might choose to go to Mera La. 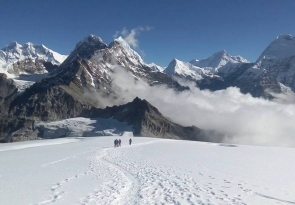 However, as we will be taking the route to High Camp through Mera La the next day, we might opt to rest at our camp at Base camp today admiring the eye-catching views the area offers. We take the route through Mera La to reach the Mera High Camp today. 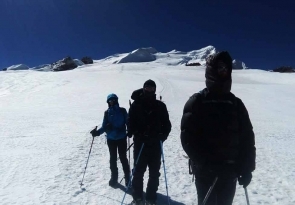 You need to walk through rock-strewn area for about two hours while making your way to Mera High Camp and this can be a bit hazardous if it has recently snowed, as there are a number of crevasses here. We make our way to the top of the rock band, which is marked by a large cairn. We set up a high camp and enjoy rest of the day the sunrise and sunset view along with the Mt. 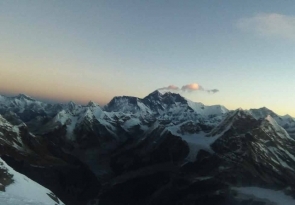 Everest, Makalu, Cho Oyu, and south face of Lotshe, Nuptse, Chamlang and Baruntse are outstanding and seems like they are piercing the skyline. This is really a big day. Our crew will wake up around 1 a.m. for preparation. You should also wake up around 2.30 am and you will have very early breakfast today. 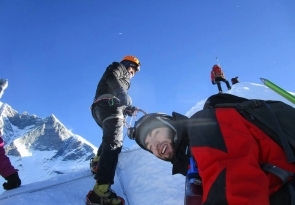 After breakfast, your group will put on crampons and rope and set up for special journey to the summit. 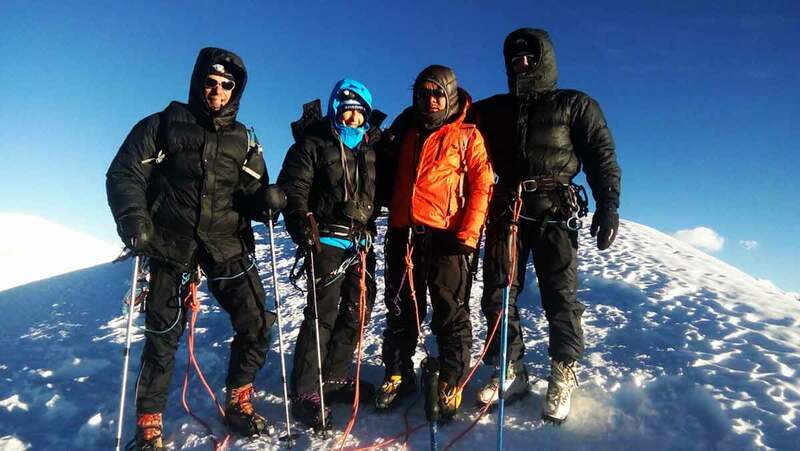 If you are a well-acclimatized group, it takes around 4-6 hours to reach the summit of Mera central for you. From the summit can be seen the magnificent views of Mt. 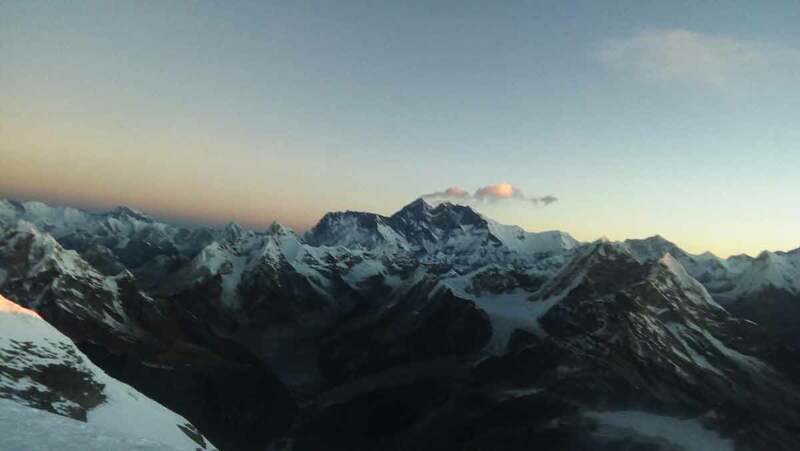 Everest (8,848m), Cho-Oyu (8,210m), Lhotse (8,516m), Makalu (8,463m), Kangchenjunga (8,586m), Nuptse (7,855m), Chamlang (7,319m), Baruntse (7 ,129m) Ama Dablam (6,812m) Kangtega (6,779m) and many peaks over six thousand. 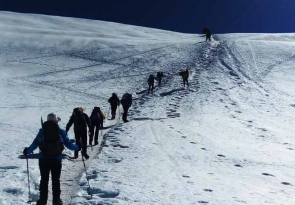 After achieving the summit, you retrace your steps down to high camp. After having a rest accompanied with some hot soups/tea at the high camp, we will continue down to Khare for the night’s rest. You will really find this day really long but inspirational one for your life! Today, we again climb up about two hours through the lush forest on the west side of the Hinku Valley to Thuli Kharka. It’s nice walk through the red Rhododendron forest with beaten trail of Himalaya of Nepal. 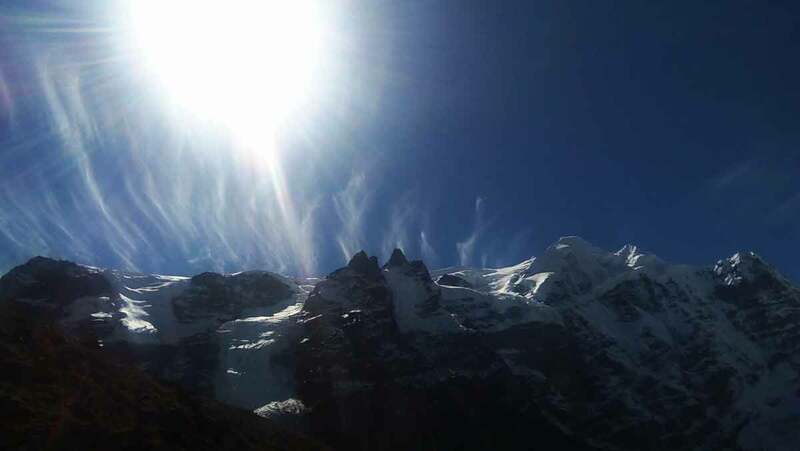 We observe the wide range of Mera peaks, Mera North, Mera Central, Mera South from Thuli Kharka. The flight time to Kathmandu are scheduled in the morning normally because Lukla suffers a lot of wind in afternoon. We fly back to Kathmandu after our long mountain journey. The early morning flight drops us at Kathmandu. We can rest and relax throughout the day in our hotel or if interested to take some Nepalese souvenir for friends and relatives, we can visit some nearby shops or venture out in Thamel for typical Nepalese goods. After Breakfast, you are transfer to the international airport for your onward destination.